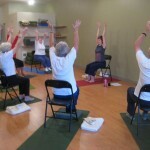 Chair yoga offers a gentle, relaxing and refreshing approach to yoga practice. Seated on a chair and standing with chair support allows students to experience hatha yoga in a safe friendly environment. 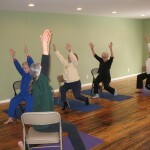 Breath work, short meditation and seated relaxations form part of the class. Our very experienced tutor, will guide you through each class and support any adjustments you may need to achieve your best.